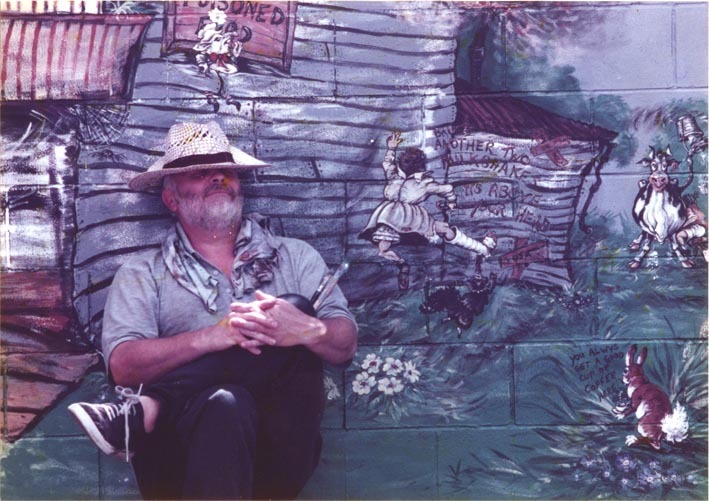 FROM THE VAULTS: Gordonton artist Chris Smith painted his eye-catching, colourful Wall of Fame depicting life and the locals of Gordonton in 1999. 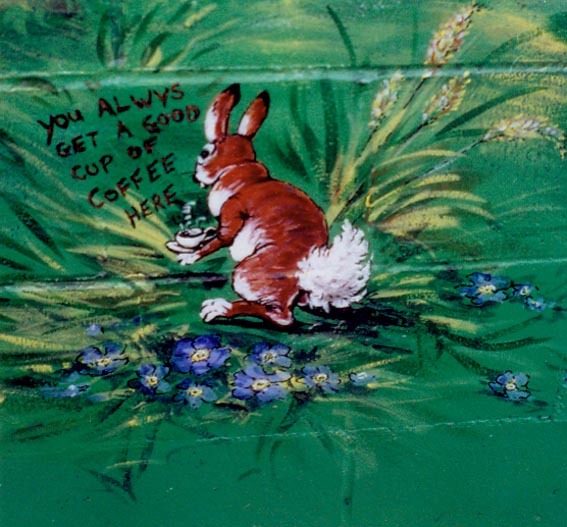 It created much comment and appreciation for at least 10 years, but was painted over when new tenants moved into the building. Annette Taylor talked with him in 2014. IT ALL JUST sort of happened, Chris Smith says of the Trading Post’s (now the dairy) Wall of Fame in downtown Gordonton. Actually, it was two walls, the glass frontage, sides and roof of the tearooms, and spilled over into the neighbouring furniture shop and might have grown even more, over time. 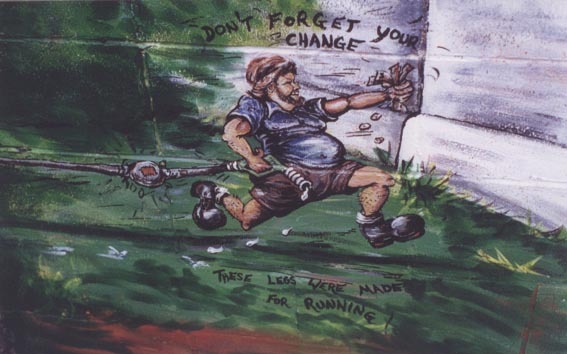 The eye-catching, colourful mural that depicted life and the locals of Gordonton was painted by Chris in 1999 and lasted about 10 years; a real-life monument. Tearoom owners Bruce and Cherie Thornton were chuffed at the project. 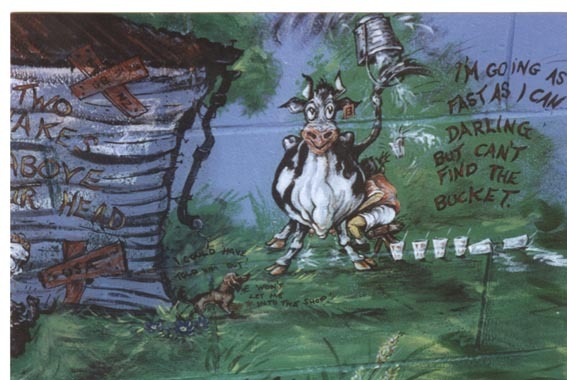 Cherie told the Waikato Times at the time she was honoured an artist of Chris’ calibre wanted to turn his skills to improving the look of the tearooms. Originally from Herefordshire, Chris arrived in Gordonton with wife Jenny in 1982. He used to work for Hereford Fine China and, after leaving, continued with his own art, making a range of china native birds, which were sold in the Trading Post. Painting the wall was a thing of joy, he says. 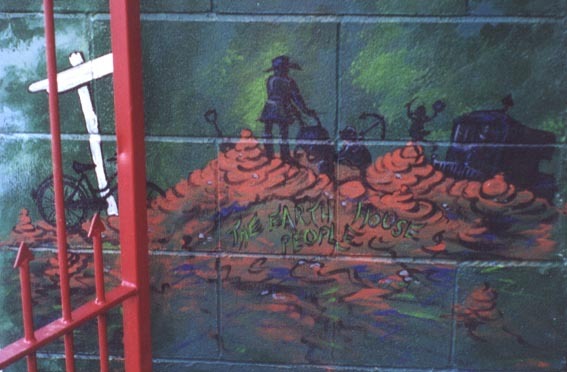 No-one ever graffitied the wall, he says. Cars and vans full of people, buses and even cyclists would all pull up and admire the wall and the artist at work. Chris hid 14 objects in it – “There was a spider, a screw with a frog on it, all sorts of things they had to find before they went inside and got their tea and scones. 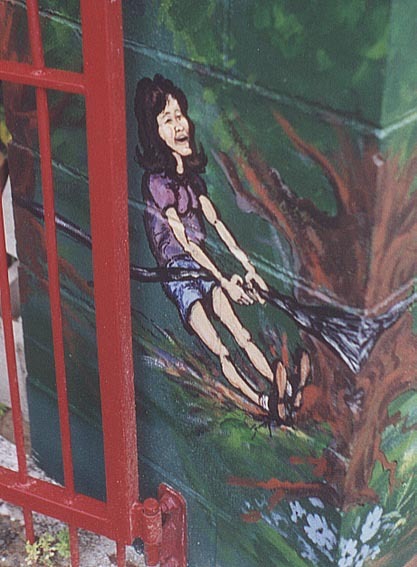 The mural was painted over when new tenants moved into the building. 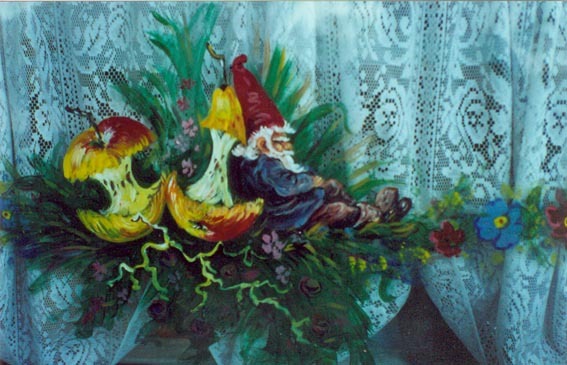 The cartoon of a greedy gnome on the tearoom’s window was particularly stubborn to remove, he recalls. 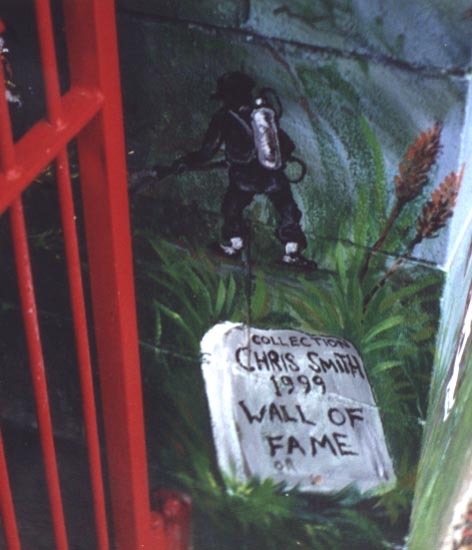 The Chris Smith Wall of Fame in its glory days. 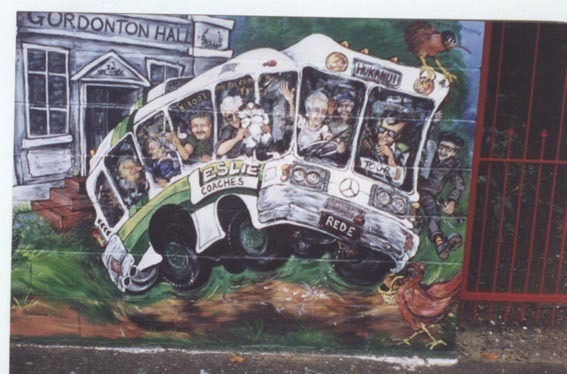 The Gordonton Express departs the old hall, driven by Leon Geddes. Jean, his wife, holds what was allegedly the fattest cat in the village. Lyndsay, one of the regular drivers, gives directions. Along for the ride are Lex Riddell, Shirley Blank, John Bridgman and Tuku in the back, Roy the mechanic runs alongside. 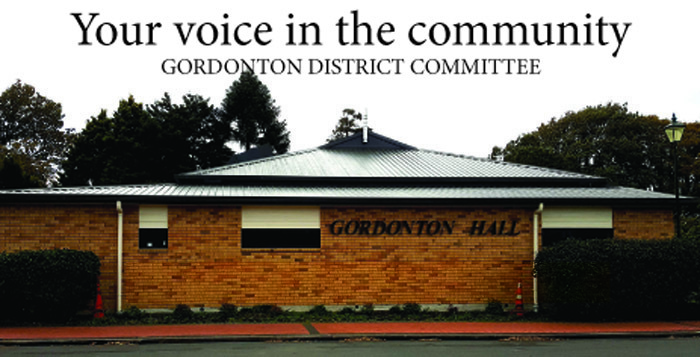 The Kiwi perched precariously on the top depicts Kiwi Experience, which was started in Gordonton by Neil Geddes. Barry Ruck from the Gordonton Garage races after someone who forgot their change – “he was as honest as the day, with a real dry sense of humour,” says Chris. Heather, below, always gave a helping hand. 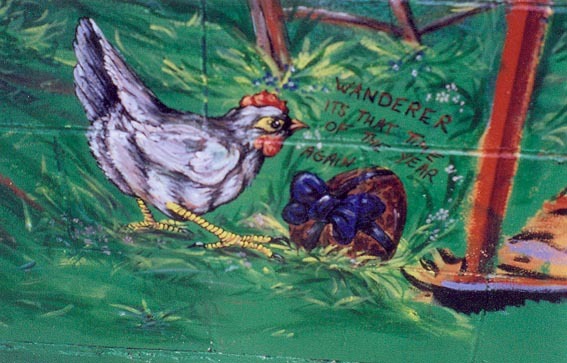 Shirley Blank’s feathered friend Wanderer. “That chicken would turn up all around Gordonton.” Husband Peter, below, was around the corner. 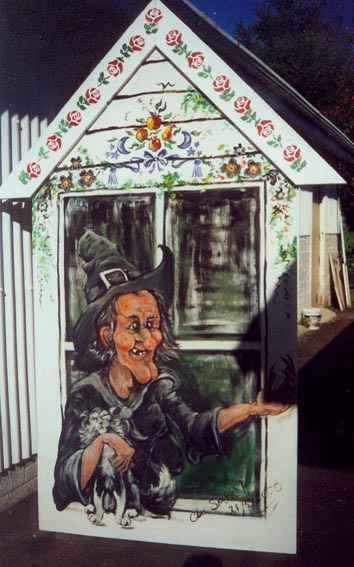 On the top of the Trading Post Chris made and painted four large windows, this one shows a witch (no one local!) with Chris and Jenny’s cat, Socks. The images may be gone but the memories will never fade Chris, many thanks from all in Gordonton! That’s a fantastic series of pics! So very well done! 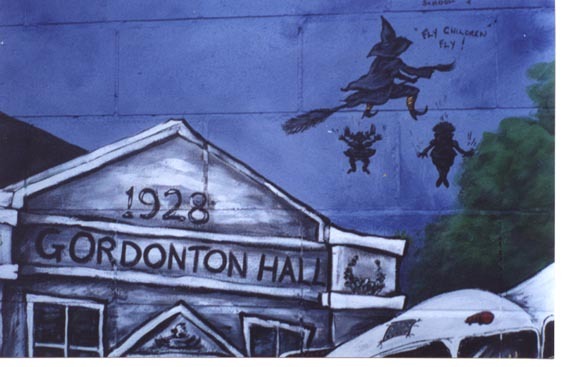 And truth to say, the pics don’t give the full glory that was the Gordonton Wall of Fame! Such a pity that these glorious images are gone 🙁 We used to love looking at them when in Gordonton. Yes, they really were fabulous. And you didn’t even know that ‘we’ featured around the corner of it! Wonderful! Can’t imagine how Chris felt after it was obliterated. Progress can be an awful thing. Start another one? Heck yes. 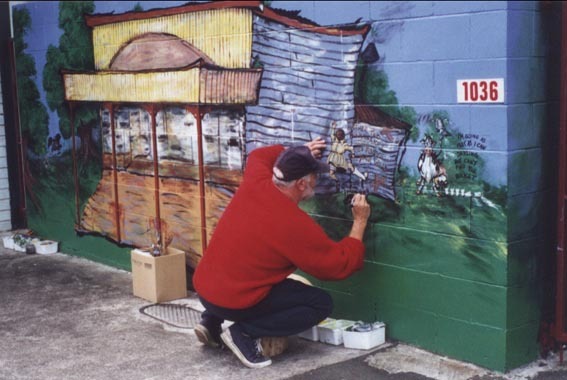 Marvellous to have a artist of Chris’s calibre living so close to home in Gordonton.